Vicious is my first adult book! It comes out in hardcover from Tor, September 24, 2013, and in paperback from Titan Books (UK), January 10th, 2014. Vicious is kind of like a comic book without pictures, a violent twist on heroes and villains. Ten years later, Victor breaks out of prison, determined to catch up to his old friend (now foe), aided by a young girl whose reserved nature obscures a stunning ability. Meanwhile, Eli is on a mission to eradicate every other super-powered person that he can find—aside from his sidekick, an enigmatic woman with an unbreakable will. Armed with terrible power on both sides, driven by the memory of betrayal and loss, the archnemeses have set a course for revenge but who will be left alive at the end? 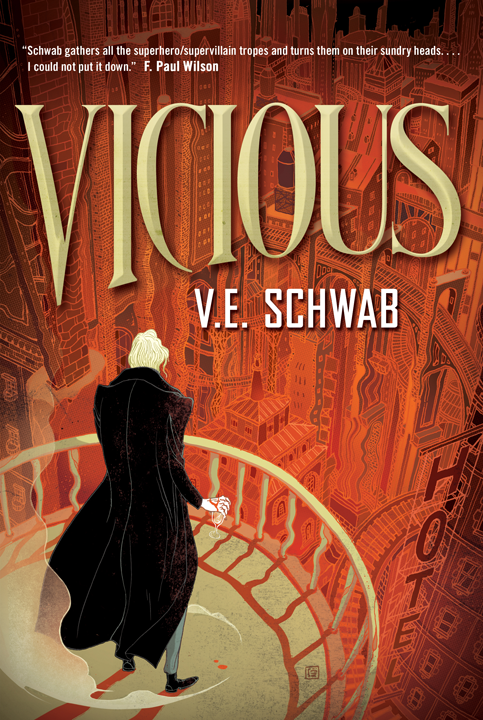 VICIOUS has now been named a Best Book of the Year by both Amazon and PW! Rights to Vicious have also sold to the UK (Titan Books) and Turkey, and to Audible! To read what people are saying about Vicious, click HERE. Just curious (because the blurb is awesome and I’m terribly excited for it), is the Eli in Vicious Eli Ever from the short fiction you wrote at Merry Fates so long ago? The piece was so grabbing then, I can only imagine how the novel would be if it is, in fact, him. I so, so, so LOVE this book! I’m serious if I say this is the best book I’ve read so far. Thank you so much for writing it and for being awesome! After reading the book, I can’t get it out of my head! (Not complaining). It was very well done and I am really lokoking forward to the sequel! Your plot that jumps around in time should have confused me … but it didn’t what a great way to provide backstory!